Napster: The File-Sharing Service That Started It All? The "aughts," as some are calling these years, have seen the music industry turned on its head. The revolution actually began in 1999, with a little project by college student Shawn Fanning. By 2000, the online file-sharing service was being sued by record labels and musicians. The next year, it was gone. But Napster's legacy lingers on. 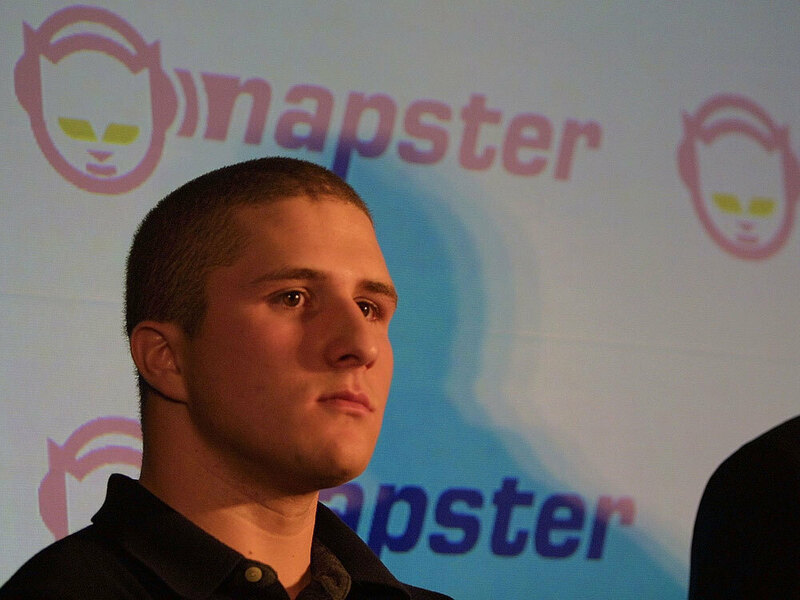 Napster founder Shawn Fanning at a press conference in February 2001, after an appeals court ruled that Napster likely violated copyright law by allowing Internet users to swap music files. Today, we begin a look back at the decade that's coming to a close. The "aughts," as some are calling these years, have seen the music industry turned on its head. The revolution actually began in 1999, with a little project by college student Shawn Fanning called Napster. By 2000, the online file-sharing service was being sued by record labels and musicians. The next year, it was gone (though its brand and logo were bought by a company offering a subscription model for streaming and selling downloads). But Napster's legacy lingers on. In the early days of the Internet, the only way to share a song was to send an e-mail attachment. Napster made it possible to access millions of computers. "Now suddenly with a search engine, anybody could access any piece of content in the world at the click of a mouse," says Eric Garland, the CEO of Big Champagne, a company that has been tracking online music habits for the past decade. Although the big recording labels shut down Napster in 2001, it was a Pyrrhic victory. "Napster wasn't the problem," Garland says. "Napster was just one symptom." Online file-sharing services turned out to be hydras. Shut one down, and two more grow up to take its place. The music industry started a war against what it called piracy that included suing music fans and enlisting celebrities like Kid Rock to make public service announcements. But millions of fans were numb to the pleas. Ask the question, and people will give you a long list of reasons they feel justified in downloading music without paying for it. Jennifer Louis, a music teacher, says that after years of paying $15 to $20 for CDs with only one song she liked, she felt ripped off. "When you overcharge your customers for your music that they love," she says, "you're treating them like their enemy, almost." Other fans, like retired furniture maker Don O'Neil, say they heard stories about artists who never saw any money from CD sales anyway. "Those artists get charged back for every single thing the record label can think of to charge them back for," he says. "They charge them back for the janitor who swept up the studio after they finished recording." True or not, it didn't matter. These were the rationalizations that floated around the Internet along with access to an unprecedented variety of music. For fans like 35-year-old student Nate Mannan, this is a golden age. "I know some artists that might disagree with that," says Mannan. "But, yeah, I think for the music fan who's able to basically sample all the flavors out there, it's unprecedented." But something may be changing. According to Big Champagne's Garland, for the first time in a decade, unauthorized file-sharing has stopped growing. Garland thinks it's because there are more legal options. Louis says it's just a lot easier to download legally. "The quality when you download from iTunes — it's just a lot better," she says. Unfortunately, Garland doesn't think iTunes or streaming services like Pandora will save the music industry. Sales of individual tracks or monthly subscriptions don't generate as much profit for the labels as CD sales. "Now, the legitimate marketplace is in many ways the culprit," he says. "It's responsible in many ways for the decline of the industry." He says that a decade from now, industry executives may be longing for the days of Napster — when they could blame piracy for all of their problems.